When performed by trained professionals, tree pruning in Morris County NJ is beneficial for the health of the tree as well as the environment. In addition to maintain the tree’s health, pruning a tree also makes your landscaping visually appealing and inviting to potential tenants. As a property manager, pruning the trees on your property is prudent for a number of different reasons. Of course, it matters who you choose to complete your tree pruning project. 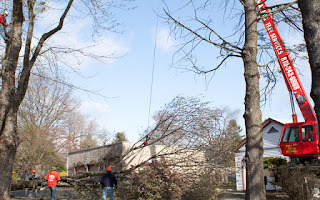 Amazing Tree Services is dedicated to providing business owners and property managers with affordable and expert tree pruning in Morris County NJ. Our fully trained and experienced tree specialists understand the various types of deciduous trees, proper care necessary, and pruning methods to ensure vitality for your tree and increased appeal for your property. Below, we've listed a few reasons why property managers should consider tree pruning services. For a property owner who needs new tenants, you want people driving or walking by to see your main office. The same is true of any signs advertising your business. Overgrown trees can make it impossible to see your business and/or signs advertising it. Tree pruning in Morris County NJ would mean improved visibility and an increase of interested tenants. For a potential tenant, there is nothing more frustrating than pulling into a parking lot and not finding anywhere to park. The unfortunate truth is some people will leave and go somewhere else if they cannot find an empty parking space. If you have overgrown trees with low branches, it is possible they are making a few of the parking spots in your lot impossible to park in. Pruning the trees is an easy way to prevent this problem. At the same time, it will make your parking lot cleaner and more inviting to potential tenants. An overgrown tree so close to one of your properties is dangerous to your home and wallet. All it takes is one good storm to knock a branch off the tree and send it through a window. Whether pruning the trees near the properties is your responsibility or the tenants, tree pruning in Morris County NJ is likely to be cheaper than the bill you will have to pay to repair the damage the tree caused. Overgrown trees near a window can also make a home an easy target for residential burglary. A burglar could decide the tree looks easy enough to climb and then open or break into the window near the tree. Don’t let overgrown trees cost you money. You can hire a professional to prune your trees and write it off as a business expensive when tax season rolls around. For more information about tree pruning in Morris County NJ, call Amazing Tree Services at (973) 343-6868. If you need land clearing in Bergen County NJ, then you're probably already considering a potential project. The procedure of clearing a plot for building is one of the feats of human engineering that never gets old. With what existed before, say an area of trees, shrubs, and other growth, can now become anything you want. You can open the land up for a new commercial property, a new warehouse, your family's new home, or even an extension to an existing office or residential location. We consider land clearing the process of getting something out of nothing. We help give you a clean slate upon which to build your next masterpiece. Amazing Tree Services performs efficient and complete land clearing in Bergen County NJ for land developers, land owners, and contractors looking to convert existing land to their vision. With our own equipment, trucks, and crane, we will promptly remove all obstacles from your property. Remaining within your time-frame and schedule, we work hard to prepare your land for construction. Our years of trusted service have allowed us to develop as a reliable land clearing company in NJ, and we are proud to be part of the development process. Our team has done much more than facilitate the building and growth of human dwellings. In our time performing expert land clearing in Bergen County NJ, we have also opened up space for farmers who want to give their livestock a more accessible area to roam free and experience the bounty of nature. We've also helped wildlife reservations in creating sanctuaries for endangered or otherwise threatened species. We take our job seriously, as the proper land clearing can help all of the world's animals have a more productive life. But as it relates to your needs, you are probably seeking some type of building project. And that's just fine! Most of our clients are people just like you who have an idea in mind of something they need to build, whether it be for work, relaxation, or general pleasure. We arrive on site for land clearing in Bergen County NJ and help fulfill even the most expansive projects. As mentioned above, we do get a great deal of pleasure in seeing what our customers create on the open space we provide for them. We see you as the artist. We are the company who produces the art materials. 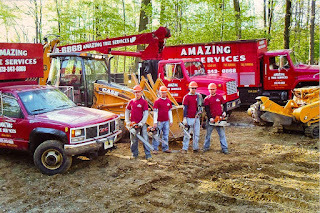 For more information about land clearing in Bergen County NJ, call Amazing Tree Services at (973) 668-0020. Looking around the planet, it's easy to get lost in the sea of trees that covers the land. Well, this is only true if you're not looking at your own property. Then, you may notice every small imperfection that is staggering your tree, your yard, or the entire property. Nature is fantastic in its design. Still, sometimes we want something a little extra, or even a little less. This is where tree trimming in Morris County NJ comes to the rescue. We know how to manipulate this wonderful bounty of nature and bring the trees back under your vision. Amazing Tree Services beautifies properties with efficient and affordable tree trimming in Morris County NJ. With years spent studying trees and just as many working in them, we know that the end of winter is a great time to have your tree's trimmed. Why? Trimming before tress begin growing again puts you in control of how they grow. Have a tree near a structure on your property? Tree trimming protects your home or building from collision with branches, keeping damage at bay and protecting against squirrels and other animals on your roof. Below, we've assembled a few more reasons why tree trimming will benefit your Morris County property. As mentioned above, one of the major reasons you may want to trim the trees on your property is for cosmetic reasons. You may want to bring new life to your home with a new design on your trees and shrubs. Tree trimming in Morris County NJ will give your trees the look you want, adding appeal and value to your property. But tree trimming is about more than looks. The procedure actually is beneficial for the trees in more ways than one. By cutting off dead or dying limbs and branches, your trees will grow long and tall. And they will also last many more years under the proper upkeep. Consider the trimming both a tune up and a haircut for the trees. One that removes any damage and helps your trees grow high into the sky. For some, trees are only about the fruit they bear. Sure, not all trees produce fruit, but even those with flowers and other growths can benefit from this procedure. In short, tree trimming in Morris County NJ will give the tree maximum opportunity to produce the biggest possible harvest. And this means more productivity for you and your home overall. There are many other reasons to consider tree trimming. Call us today and speak to our expert staff for more information. For more information about tree trimming in Morris County NJ, call Amazing Tree Services at (973) 343-6868. Removing a tree from your property can be a large-scale projects with many different variables and considerations. The condition of the tree, its location on your property, and its size are important factors to consider when performing tree removal in NJ. Though many choose to remove trees from their property for various reasons, recent outbreaks of the Emerald Ash Borer have been located in NJ ash trees, wreaking havoc and killing trees. It is important to remove trees infested with EAB before the tree becomes a danger to your property. Amazing Tree Services serves NJ residents and property owners with prompt and affordable tree removal in NJ. Our professional tree specialists develop successful strategies to safely remove trees from properties. With our own crane and equipment, no matter where a tree is located on your property, we have the means to remove it. Our years of experience have allowed us to develop as a trusted, reliable tree removal company, and we strive to meet the satisfaction of our customers and exceed their expectations. We work without delay to remove diseased, damaged, or dead trees from your property and give you peace-of-mind. Branch Arrangement: ash branches are located directly across from each other with a single bud at the tip of the branch - not staggered like other deciduous trees. Bark and Branch Texture: Look for diamond shaped ridges in the bark of mature trees. Young ash trees feature smooth bark. Ash tree branches do not have a waxy coating. Leaves: Perhaps the most significant trait of ash trees. Ash leaves have 5-11 leaflets, which may be toothed or smooth. If you see leaves fitting this description with the branch arrangement mentioned above, you probably have an ash tree. The only other type of tree with these features is boxelder, however they have 3-5 leaflets. Once you have established that you have ash trees on your property, it is important that you call experts to inspect the tree for EAB infestation. Because of their recent sightings in Pennsylvania and New Jersey, it is quite possible your tree is infected. Once an infestation has been identified, it is imperative that you call for expert tree removal in NJ to ensure proper protocols are followed and that the tree is successfully removed without delay. Emerald Ash Borers have so far been spotted in 25 states, and have decimated tens of millions of ash trees since being discovered in 2002. Their spread has since raised concern in many communities facing difficulty eradicating their presence. If you are experiencing an EAS infestation in your tree, call us for affordable tree removal in NJ. For more information about expert tree removal in NJ, call Amazing Tree Services at (973) 343-6868.